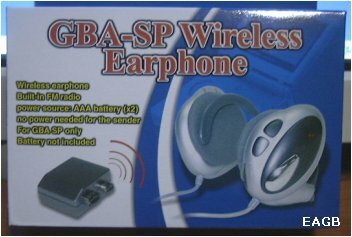 If you prefer using earphones with your SP but don't want the hassle of tangled and unsightly wires, then the GBA-SP Wireless Earphone from a third party manufacturer might just be what you need. - Transmitter powered by the SP and requires no batteries. - Earphone receiver runs on only 2 'AAA' batteries. Inside the box you'll find a rather large pair of clip-on type earphones and a transmitter module. The right earphone basically serves as the control center and here you will find two button controls, one labelled 'Scan' and the other, 'Reset'. 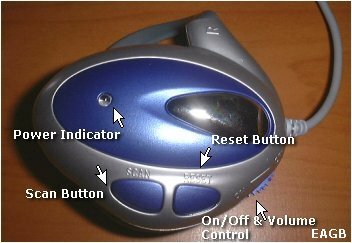 Next to it is a scroll wheel that serves as an 'On/Off' switch and volume control. The left earphone houses the battery compartment. 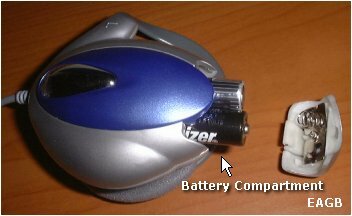 Two 'AAA' batteries are used to power the earphones and are not included with the package. 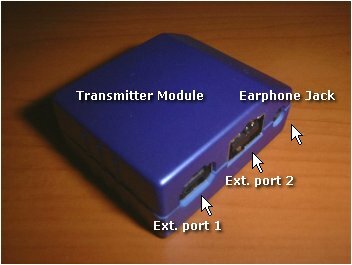 The transmitter module inserts into both of the Ext. ports on the SP. It has a pass-through for both these ports as well as an additional earphone jack for regular wired earphones. 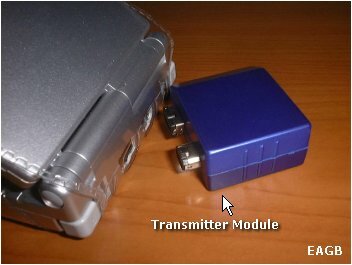 With the transmitter plugged into the SP, players can still charge the SP and use the link cable. The transmitter module gets its power from the SP itself and does not require any batteries. Using the Wireless Earphone is simple. First, make sure that the SP is off, then plug in the transmitter module into the SP's Ext. ports as shown in the picture below. You can now turn on the SP. Next, clip on the earphones and turn it on. It will take about a second for the earphone to find the signal from the transmitter but immediately enough, you'll hear sound from the SP playing through the earphones. You can then adjust the volume according to your preferences. The earphones also support FM radio, so when you're tired of playing and want to listen to some radio tunes instead, you'll only need to switch off your SP, and the earphones will quickly scan and start playing the first clear FM channel it finds. Using the 'Scan' button, you can also toggle through all the available channels that are available. If, however, you want once again to play your game, all you have to do is turn on the SP and press the 'Reset' button on the earphone. The 'Reset' button will always scan for signals from the transmitter first before the radio channels, so in case you wonder away from your SP and loose the signal, just press the 'Reset' button to get it back again. In my test, I found that the effective range of the transmitter is about 1 meter from any angle. This is more than adequate I think, since it's unlikely that anyone human has a reach of more than a meter. Since the earphones and transmitter work on radio signals, there is also no need to maintain a line-of-sight to get good reception, as such, you can play your SP in any position you want, either sitting, lying or upside down. First of all, I really like that it's wireless since it gives me the freedom to move around with my SP without worrying about wires getting tangled. The reception is pretty good and for it's cheap price, the sound quality is also pretty decent. The biggest plus point, however, is the built-in auto-scan FM tuner that worked really well and received all the available stations in my area. I didn't like the size of the bulky earphones and found that they were too heavy. This is expected of course, since the earphones also houses the batteries. I could have dealt with the weight if only the ear-clips were better made and lined with some kind of padding. After using the earphones for about an hour, they did start to feel a little uncomfortable, mainly because the cheap plastic clips were starting to pinch at my earlobes. Also, remember not to play at high volumes, not only is it bad for your ears but if you accidentally loose the signal from the SP, the FM signal will kick in immediately and give you the shock of your life, especially if it happens to lock onto a heavy metal station. This happened to me when I stupidly forgot and put my SP down to go to the pantry to get a drink - trust me, it's no fun getting frightened like that! Although the sound from the earphones was good most of the time, I did have some odd experiences with some games. I'm not sure why, but the sound on some games just didn't sound clean, and always seemed to have a strange and intermittent buzzing noise. My guess is that these games had certain sounds frequencies that were either to high or too low for the earphones to play properly. Like I said, these earphones are cheap, so they probably aren't able to adequately handle the full dynamic range in the sound spectrum. For it's price, the GB-SP Wireless Earphones seems like a pretty good bargain since it also includes a built-in FM radio. Added to this, it also gives the user total freedom from messy or tangled wires. Sadly, however, despite the cheap price, it will still cost you more in the long run since it relies on batteries. My biggest gripe, however, was its poor design and the rather hefty weight of the earphones (plus batteries) which made prolonged usage very uncomfortable. All in all, compared to a standard wired earphone, this particular incarnation of a wireless earphone for the SP is still very inferior. The manufacturers have overlooked quite a few important points in the design department and as such, I can only give it two stars..